This season was depressing for me for so many reasons. Tim Duncan retiring was bad enough and I still haven’t gotten over that. But then we had Tony Parker revitalizing himself in the playoffs only to go down to a terrible injury, Kawhi dominating the Warriors only to go down to a terribly timed injury and LaMarcus Aldridge not being removed from the Spurs. And to top it off, Manu was possibly going to retire. Granted, he played great in the Warriors series and it would have been a strong ending to his fantastic career but still, I always want more. Well with the news that Manu is coming back for at least one more glorious or less than glorious run, I decided to write about my favorite Manu games of all time (playoffs only). But beware, this ain’t no simple top 5 or top 10 list, no sirree bob. This, my friends, is a TOP 12 list. Enjoy. All Spurs fans either remember this game or know about this game. Its that classic double-overtime game where the Suns (after years of being tormented by the Spurs) threw everything they had at us and the Spurs still pulled a rabbit out of their hat. It felt like this game was the exclamation point on the Spurs dominance of the Suns during the mid-2000’s. Also, Tim Duncan had his shot which probably is his iconic image. Though he always looked like a lovable spaz when celebrating. Of course, it would not be remembered as fondly by us Spurs fans if Manu hadn’t had a burst in the second OT. Timmy was exhausted from carrying the Spurs in the first 53 minutes and pumping his fist really hard after his three. Parker had fouled out and the Suns kept on coming at us. Manu hadn’t scored since the Spurs first possession of the fourth quarter but, like he is prone to do, decided now was the time to take over the game. He drove repeatedly at Shaq, swinging those elbows viciously during each ferocious drive to create space and keep the Spurs on top. He did it once, twice, three times. Then after Steve Nash tied it on a ridiculous drifting, falling out of bounds, corner three, Manu had the ball. He took his time, jab stepped a couple times and then took Raja Bell to the basket for an incredible leaning bank shot with about two seconds left. Game over. Ahh the textbook, fade-away, 45 degree, buzzer beating layup. So you may ask why is this game this high on my list? Well how many people really remember that Steve Nash shot that preceded Manu’s shot that I mentioned above? Most people don’t remember that shot because the Suns lost the game (and the only ones who do remember it are either Suns fans or Spurs fans who have rewatched this game several times). And you know what? Timmy’s three would have been forgotten if the Spurs lost this game. Just like his shot over Shaq in Game 5 in 2004. Just like his dominant Game 6 against Miami in 2013. Manu’s finishing flourish made sure that Timmy’s signature shot was immortalized. So thanks Manu, that was real swell of you! Also it helps that this was one of the greatest (if not the greatest) Spurs games ever. Manu never worried me before a big game (except for before Game 7 against Miami in 2013 but lets not talk about that). Throughout his career, he showed an incredible ability to hit big shots, (see above) make the winning defensive play and respond to adversity in a consistently amazing manner. 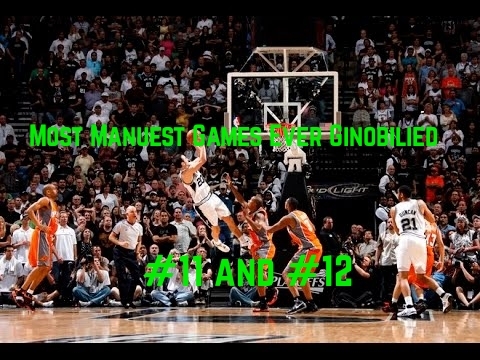 This is the obscure game that showed me what kind of player he was in the toughest of moments and that’s why it is #11 on my list. This is how obscure this game was…this is the only picture of Manu I can find from it. Things were looking horrible in this game. The Spurs had already lost a heart-breaker in Game 1. Tony Parker struggled for the second straight game against Marbury and the Suns had us completely out of whack. Timmy had just pulled us back from a seven point hole in the fourth quarter but now both teams offenses were out of sync and we were definitely at risk of going down 0-2 against the 8th seed, up by only one with a minute left. That’s when Danny Ferry swung a pass to that rookie from Argentina with the shot clock running down. Manu was a sizzling 2/9 up to this point…and yet there was absolutely no hesitation on the shot when the ball came to him. He calmly stepped up and gave us the breathing room we needed and simultaneously generated my all-time favorite Mike Breen “BANG” call. I honestly think if the Spurs had lost this game, we would have lost the series and the Lakers would have won their 4th straight title.